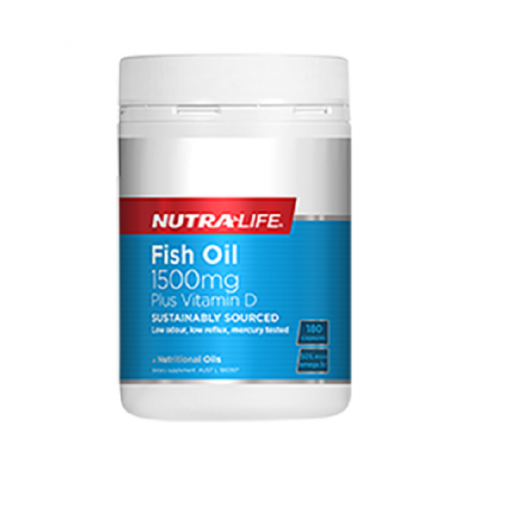 This formula is a rich source of the important omega 3 fatty acids known as EPA and DHA. The body requires these fatty acids for healthy joints, heart, circulation, brain and skin health. Fish oil may also help to temporarily relieve arthritic pain, swelling and inflammation. These ingredients are sources ethically and sustainably from cold water fish and is then encapsulated and package in New Zealand. Each capsule also provides vitamin D which assists in maintaining heart, immune, brain and supports healthy and strong bones. This high-strength, natural fish oil formula is made from cold-water fish that are sustainably and ethically sourced. The oil is then encapsulated and packed in New Zealand. 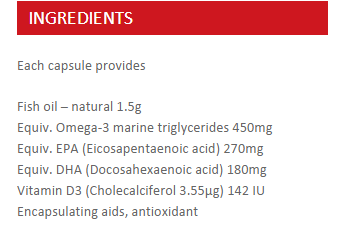 Each capsule provides 1500mg of natural fish oil: a rich source of the essential Omega 3 fatty acids EPA and DHA. That means 50% more Omega 3s compared to Nutra-Life Fish Oil 1000mg – so you can get the same effects in fewer capsules. Your body uses Omega 3 essential fatty acids to support joint health. Omega 3 oils also support the health of the heart, brain and skin. Each capsule also provides Vitamin D to help maintain immune system health, and support bone health. Recommended Adult Dosage: For joint health, take 6 capsules daily. For skin health, take 6 capsules daily. For heart health, take 2-4 capsules daily. For healthy brain function, and general well-being, take 2-6 capsules daily. All doses to be taken with food & a glass of cold water. Or take as directed by your healthcare professional.